Toddlers learn by watching, trying things out, and playing. Being a speech therapist for over a decade and a mom to two delightful children, I’ve had the luxury of playing with many, many toys. I really like toys. Here’s a list of some of my favorite toys to promote play and language skills. In My Toddler Talks: Strategies and Activities to Promote Your Child’s Language Development, I share step-by-step play routines using these toys to specifically teach you how to elicit and model language. These are classic toys that are in most daycares and households. I purposefully tried to choose such toys so a busy parent doesn’t feel compelled to go out shopping and spend a fortune buying new, fancy toys. Keep it simple by rolling, bouncing, and gently tossing or throwing a ball to your toddler. He'll love the playful interaction, as well as with time, develop the skill. Can also incorporate siblings with ball play! I love using bingo markers with toddlers because they are easy to hold and young children can color larger sections of a paper or coloring book with less effort than crayons. Knock 'em down and stack 'em back up! 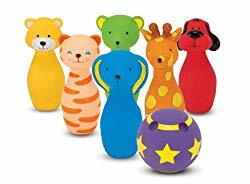 In My Toddler Talks: Strategies and Activities to Promote Your Child's Language Development, I share step-by-step play routines using bowling pins (and all of these toys on part 1 of this list) to specifically teach you how to elicit and model language. I haven't met a toddler who doesn't LOVE bubbles. Great way to elicit so many words. Just be careful not to have them in your child's mouth. I'm a big fan of getting kids to go outside! Entice your child to play outside by drawing on the driveway or sidewalks. 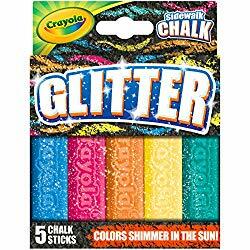 To spice things up you can even spray the chalk off with a hose or a can of water. Many older toddlers like playing the role of caregiver. You'll be amazed at how many gestures and words they will imitate from mommy and daddy during their play. Giving the baby doll a bottle, burping the baby doll, rubbing his or her back and tucking the doll are just a few ways your toddler can pretend to me a caregiver. I like this set because it's simple - there's no distracting music or bells and whistles. The doors open and close so you can encourage your child to knock on the door and have the various farm animals go in and out of the barn. This is a classic toy that assists in teaching about basic body parts by putting the pieces in and taking them out of the iconic potato head. Playing with Play-doh is such a blast! Please see my post, How to Use Play Dough to Get your Toddler to Talk. Play-doh may not be appropriate for younger toddlers who are still exploring the world with their mouths. Can follow along with the play routine in My Toddler Talksto learn many ways to develop your toddler's play and encourage early language. 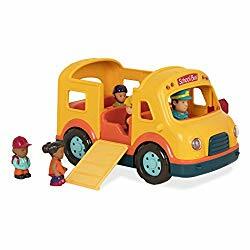 Sing the song, Wheels on the Bus too! Trying to spin a top can be tricky, so a toddler who is performing at this age will first try to figure it out and then give it to you to make it go or spin. This creates the PERFECT opportunity to encourage your toddler to request help. Requesting is an early developing communication function. In my book, My Toddler's First Words, I write about the various communication functions and how to encourage them. Note: These toys are primarily for children older than 18 months. This is because, in my experience, younger toddlers enjoy playing with ANYTHING! They will happily play with your pots and pans, serving utensils, cardboard boxes, and pretty much anything that belongs to an older sibling or something that you don’t want him or her to touch. Of course, this is also true for older toddlers, but as your toddler ages his or her play skills should grow and develop.